Very late on Thursday night here in the UK, Blizzard finally released a huge post of information relating to the Warlords of Draenor expansion. The Alpha patch notes in their entirety can be found on the Battlenet site but be warned, they are lengthy, fairly detailed in some areas and very likely to cause some upset, especially with Class changes. This is a gold making blog however so I've been following my fellow gold makers, reading up on various bits in the patch notes and have a few comments to make myself. The main point that struck me (and many of my fellow gold bloggers like Selltacular over at Copper to Gold), is the removal of 76 major glyphs from the crafting process. These will instead be learned automatically at various levels during the leveling process. I've not been in the Glyph market for a long while now but not all of the removed glyphs are good sellers anyway. Selltacular says 12 are in his best sellers list but of course, your server may be different so the extent to which your market suffers will depend on which glyphs your server population likes best. Whilst this list of removed glyphs may change, I would suggest that you keep an eye on your own stock levels and as more information is released over the coming months, make sure you don't craft too many at a time or get stuck with a large stock of them. Keep an eye out for additional glyphs to be removed or for this list to be changed though. We can currently herb or mine in Pandaria even if we don't have maxed gathering professions. This was introduced in patch 5.3 as the frustrated screams from gatherers having to pass by nodes they couldn't gather finally reached the ears of Blizzard. The answer was fairly simple in the end - just allow lower skilled gatherers to get just a fragment from the node rather than a full sized herb or ore. This is being extended throughout the world for Warlords of Draenor, where a Gatherer can interact with any node at any level but the resulting material gathered is based on their skill level. This is one piece of news I am very happy to see - trying to level a gathering profession whilst leveling an alt was hard enough anyway but with reduced XP requirements, additional heirlooms and various buffs, it became almost impossible to keep up. I don't think this will change much before actual release either as it really is a much needed improvement. "Some of our goals with Professions in Warlords of Draenor are to make them more of a personal choice, and less of a mandatory “min/max” selection. To that end, we're removing the direct combat benefits of Professions." I read this as being the removal of things like the Blacksmiths' extra sockets bonus, the Leatherworkers' bracer fur lining, the Jewelcrafters' Chimera's Eye gems and the Scribes' shoulder enchant. How will this affect gold making though as none of these items can be sold anyway? I think the 'min/max' comment in the quote above points us to that answer - raiders! Many raiders level professions reluctantly - they aren't really interested in making a lot of gold. What they want from professions is the best combination of profession related perks for their class and spec. So if these combat benefit items are removed, raiders won't have the need to level their professions any more. If raiders don't have professions, they will then need to buy crafted items like potions, gems, flasks etc and perhaps crafted armor & weapons too although I'd expect them to look for a friendly crafter before hitting the Auction House. It may even increase the supply of some materials though - things that get picked up randomly whilst out questing may be sold on the Auction House rather than kept for own use. I'm not sure how much of a bonus this will be though - we still don't know enough about how the Crafting professions are changing to make a call on this one. The most important thing to remember is that these are Alpha notes - the very earliest version of details that we have been given and almost 100% guaranteed that there will many, many changes still to come. It's way too early to get upset or start worrying about this stuff just yet. With a possible release date for Warlords of Draenor in December, we have possibly 8 months still to wait for the actual game release although of course, Beta should come out way before then. 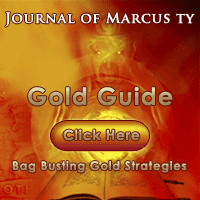 I shall be trying to keep up with the flood of information and working out how it can benefit our gold making, of course but feel free to leave comments or drop me an email if you think I've missed something or would like further discussion on a subject. Check out some of my Squidoo lenses! Ironpaw Tokens - Yet More Thoughts! You're a Goldmaker, You're a Goldmaker, EVERYBODY is a Goldmaker!!! Guild wars 2 pre orders coming soon!